Klamath, CA (Norcalhostels.com) - After 22 years accommodating travelers from around the world, the Redwood National Park Hostel will close its doors indefinitely on January 18, 2010, due to a lack of available funding for necessary repairs to the historic former pioneer homestead. The hostel is in need of extensive reconstruction, including seismic retrofitting as well as renovations to bring the building into ADA compliance. Preliminary assessments estimate the cost of these repairs at more than $1.5 million. 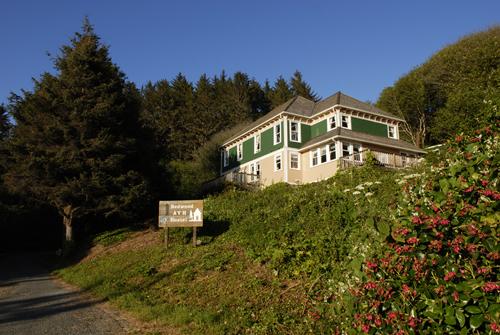 The closure is the result of a joint decision by the National Park Service at Redwood National and State Parks, which oversees the building and the site, and the Golden Gate Council of Hostelling International USA, which operates the hostel. HI-USA Golden Gate Council, a nonprofit organization, hopes to raise the necessary funds to complete the renovations and reopen the hostel in the future. The Redwood Hostel has hosted more than 75,000 travelers since it first opened in 1987. Over the past three years, overnight stays have increased by 40%, and the hostel has become one of the highest-rated in the world. The Lonely Planet travel guide "U.S. and Canada on a Shoestring" lists it as one of the "Five Best Hostels" across the two countries, and in 2008 the hostel tied for first place (with the Shin-Osaka Hostel in Japan) for highest customer satisfaction ratings worldwide, according to the International Youth Hostel Federation. "As word of the hostel's potential closure spread, our guests, as well as members of the local community, expressed an overwhelming disappointment," said hostel manager Kaci Elder. "It's heartbreaking. Yet they have encouraged us not to give up, and to remain optimistic that funding will come through to retrofit the hostel for another generation of travelers." Steve Chaney, Superintendent of Redwood National and State Parks, said that "in light of all the positive results coming from Hostelling International's management of the hostel, the just completed award of a seven-year concession contract to HI, and the simply remarkable character of this hostel, it was devastating to learn about the building's serious structural deficiencies. While these problems are forcing us to discontinue use of the existing building, we are hopeful that HI, with assistance from the NPS and other regional interests, will find a way to continue to offer a hostel experience to park visitors." The site where the Redwood Hostel stands today was established as a pioneer homestead in 1877, when Swiss-born Peter Louis DeMartin and his family built a log home and began raising crops and livestock. Even during these early years, the home was open to travelers, who were offered a bed for 25 cents per night. In 1889 the DeMartins built a new home and hostelry, with more space for travelers. After Louis DeMartin passed away in 1907, his children undertook a complete reconstruction of the house, including the addition of a second story. The house remained in the hands of the DeMartin family until 1944, when it was sold. By 1985, the house was vacant and boarded up, and locals questioned whether it should be torn down. HI-USA Golden Gate Council undertook major renovations in partnership the National Park Service, the Coastal Conservancy, and the California Conservation Corps, and the Redwood National Park Hostel opened its doors to travelers in June 1987.